How does the cell ensure transmission of an exact complement of chromosomes each cell division? How does this process go awry in cancer cells? These are questions of interest to our lab. We use a variety of techniques from single-molecule biophysical approaches to biochemistry, genetics and microscopy to explore the regulation and assembly of the machinery that ensures each daughter cell receives a full set of chromosomes every cell division. 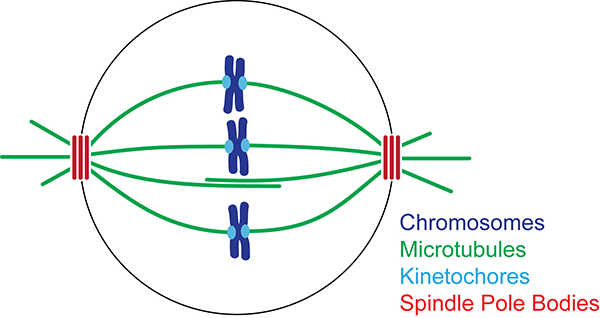 Chromosomes are segregated to daughter cells by a microtubule-based molecular machine, the mitotic spindle. The spindle has two poles, each one carrying an exact complement of chromosomes to each daughter cell. Spindle morphogenesis requires spatially controlled microtubule nucleation. The proteins required for nucleation are known, but they are surprisingly inactive in isolated form. We are studying how these proteins are activated to nucleate microtubules during spindle formation and how their activation is regulated. (A) Fluorescence microscopy of the S. cerevisiae mitotic spindle. Bipolar spindles are formed by two spindle pole bodies (red), each of which nucleate microtubules (green). (B) The γ-tubulin small complex (γ-TuSC) associates with the spindle pole body and is required for microtubule nucleation. Left: FRET relationships used to determine the overall architecture of γ-TuSC. Right: structure of a single γ-TuSC. Chromosomes attach to microtubules via kinetochores, multiprotein organelles that span from the DNA to the microtubule. Once attached to the end of a microtubule, kinetochore components do not turnover; however, the microtubule ends remain dynamic. The addition and removal of thousands of tubulin subunits drive kinetochore oscillations. Persistent attachment to the dynamic microtubule end is essential for accurate chromosome segregation. We are currently investigating how kinetochores maintain their attachments to dynamic microtubules while withstanding tension. We also study the mechanisms that provide for the targeted release of incorrect kinetochore-microtubule attachments. (A) TIRF microscopy movie of human Ndc80 complex (green) stabilizing a depolymerizing microtubule (red). (B) Schematic of an optical trapping experiment. 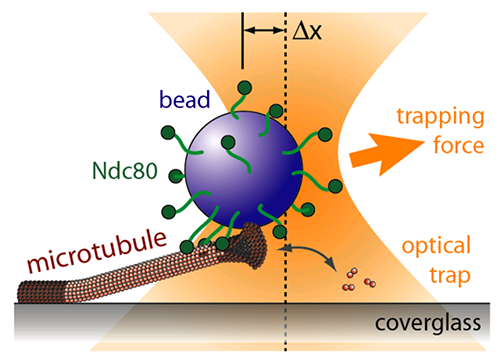 A bead decorated with Ndc80 complex can track processively with a dynamic microtubule tip against applied tension. 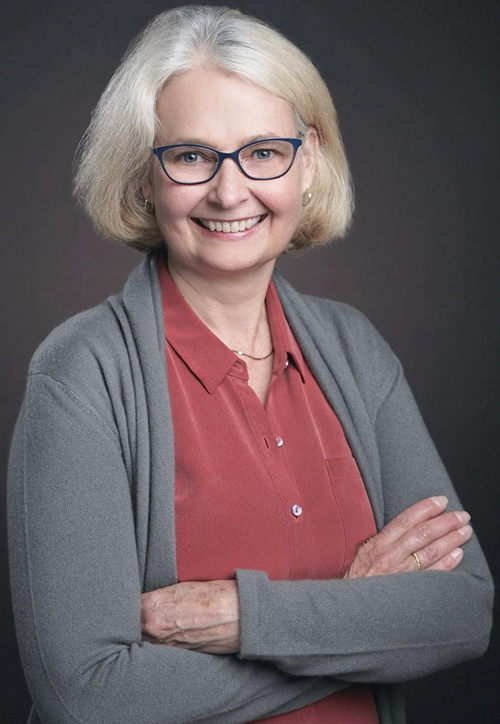 Finally, we are part of the Yeast Resource Center, which is Biomedical Technology Research Center focused on developing technologies to understand the effects of protein variation on structure and function.